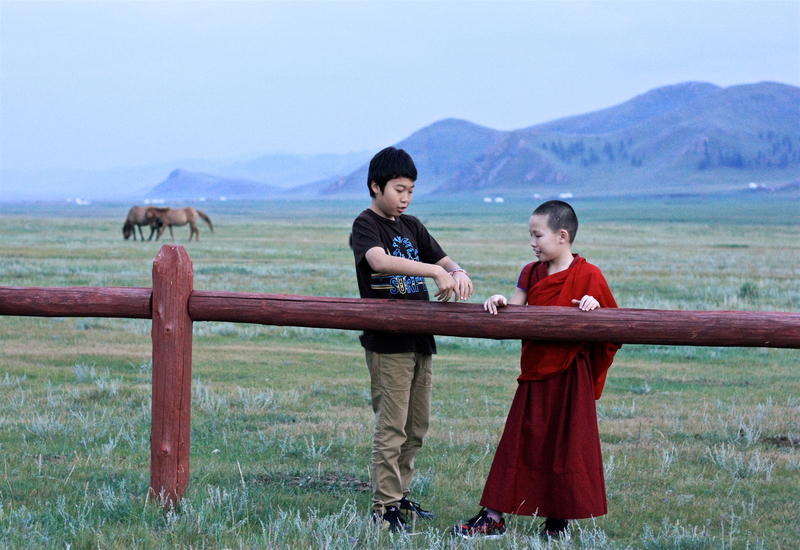 Two boys chatting in front of Amarbayasgalant Monastery in the far north of Mongolia. Horses graze peacefully to the left and in the far background, nomads' yurts (Mg. gers) may be seen lining the base of a mountain range that conceals the setting sun. When the taller boy’s parents begin speaking with the older lamas, he takes the opportunity to strike up a conversation with a monk his own age. Quickly and quietly, they become like old friends in just a few moments. Local legend tells that this monastery was founded to be the resting place of Zanabazar, the first great lama of the Khalkha Mongols in the seventeenth century when a search party saw two local boys playing on the grasslands. The party took it as an auspicious sign, and chose that place to build the monastery, which they named after the two boys (Mg. “Amur” and “Bayasqulangtu”). This scene nostalgically brings us back to that moment, though it remains firmly in the present in so many ways. In her recent work with Courtney Bender, Wendy Cadge, and David Smilde , Religion on the Edge: De-centering and Re-centering the Sociology of Religion, Peggy Levitt has challenged contemporary thinkers to explain the “contingent clustering” that happens at the sites and spaces of encounter in religious experience. This photograph is exactly about that. It is not simply a story of “tradition” versus “modernity” but rather, one of recovery, encounter, and social relations. These boys were both born into the post-Communist society of modern Mongolia. During the Communist period (1924-1992), religion was highly regulated in Mongol society and many monasteries were dismantled or closed. In spite of the fact that Tibetan Buddhism was and remains the most popular religion in Mongolia, for the generations that grew up under the Mongolian People’s Republic, it was largely an abstracted concept in the public sphere. This has changed in Mongolia since the collapse of the Soviet Union: parents have begun sending their children to monasteries again, and monks have begun a re-engagement with the large sector of Mongolian society that remains nomadic. This photograph naturally shows a society in change through its youth. The children are not pictured passively here because they are not simply passive actors. We see engagement. It is the very act of encounter between these two children that is today keeping the faith and preserving tradition. Old ties are being rekindled one nomad at a time. These two boys wear similar sneakers, they know the same children’s’ games. While the crimson robes of the younger boy might make him at first appear “different,” there is actually little feeling of distance in this scene. Interaction between children (Corsaro: 1997) is critical here. If the social processes at work in contemporary Mongolia see a re-flourishing of traditional culture, there will be a myriad of hidden, small moments such as this which will help facilitate it. Though there remains a tendency to see tradition as the bastion of elders in a society, new sociological work in the fields of religion, childhood, and culture is underscoring the importance of those moments in life when the adults step away. A Chinese man selling newspapers and journals from a mobile cart. This touching scene captures a moment and a method of the dissemination of information that has become ever rarer in today’s China. This man puts a series of recent newspapers and journals on his mobile cart, and customers can browse freely and leisurely. The man in this photo probably did not worry much about theft; he knew many of his morning and afternoon clients. He never expected to get rich through this profession. He probably just wanted to get by and pay some basic bills. Most importantly, as customers skimmed over the day’s news, this man could give a word or two of commentary or recommendation – a kind of insider’s view from the streets – from the perspective of a person whose job it is to sell the news. In this photograph, we are treated to a moment when, maybe due to a lack of customer or simply a mid-day rest, he shuffles through his own papers to look for a headline which catches his eye. Yet he is not bored, not does he dislike the job: this vendor has agency and power more than his humble cart might imply. The practice of selling newspapers in this fashion became common in Hong Kong during the first half of the twentieth century and gradually spread to the mainland in subsequent decades. These carts have almost completely been replaced by much more daunting and less inviting stands in twenty-first century China. At the time this photo was taken, this vehicle of information (the news cart) was mobile. In the image, two rocks have to be placed on either side of the wheel to prevent the cart from moving. At the end of the day, he would take his cart back home. The place on the street where his cart stood that day would be empty by night’s fall. This beautiful photograph captures a system of distribution of knowledge and allows viewers to see it on par – as important – as the information itself. We get a living example of what Manuel Castells has defined in his trilogy, The Information Age: Economy, Society and Culture as “production, power, and experience” (2000), localized social dynamics produced through and invariably linked to the economy, state, and social order. This is experience: the image informs by documenting a way of knowing that informed the self and societal narratives of a generation. In this image, we see China as a media-saturated society and as a developing information society (Giddens: 1991), but one which has still retained a personable experience of information consumption. In this pre-internet world, customers might need advice on which news or magazines to consume as they head to work. The man in this photo was that middleman, whose functions are no longer necessary with the increasing saturation of the information society we see in embryo here. At last, there is a feeling of dismay that perhaps the decline of persons like this has left the distribution and commentary of media information to invisible and powerful actors. 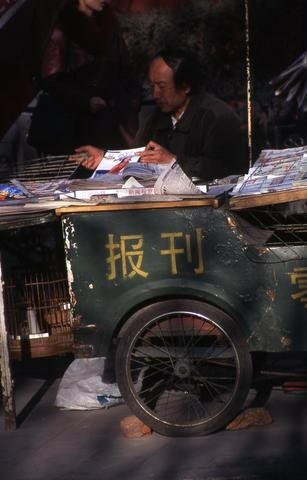 A Chinese man selling newspapers and journals from a mobile cart. This touching scene captures a moment and a method of the dissemination of information that has become ever rarer in today’s China. This man puts a series of recent newspapers and journals on his mobile cart, and customers can browse freely and leisurely. The man in this photo probably did not worry much about theft; he knew many of his morning and afternoon clients. He never expected to get rich through this profession. He probably just wanted to get by and pay some basic bills. Most importantly, as customers skimmed over the day’s news, this man could give a word or two of commentary or recommendation – a kind of insider’s view from the streets – from the perspective of a person whose job it is to sell the news. In this photograph, we are treated to a moment when, maybe due to a lack of customer or simply a mid-day rest, he shuffles through his own papers to look for a headline which catches his eye. Yet he is not bored, not does he dislike the job: this vendor has agency and power more than his humble cart might imply. The practice of selling newspapers in this fashion became common in Hong Kong during the first half of the twentieth century and gradually spread to the mainland in subsequent decades. These carts have almost completely been replaced by much more daunting and less inviting stands in twenty-first century China. At the time this photo was taken, this vehicle of information (the news cart) was mobile. In the image, two rocks have to be placed on either side of the wheel to prevent the cart from moving. At the end of the day, he would take his cart back home. The place on the street where his cart stood that day would be empty by night’s fall. This beautiful photograph captures a system of distribution of knowledge and allows viewers to see it on par – as important – as the information itself. We get a living example of what Manuel Castells has defined in his trilogy, The Information Age: Economy, Society and Culture as “production, power, and experience” (2000), localized social dynamics produced through and invariably linked to the economy, state, and social order. This is experience: the image informs by documenting a way of knowing that informed the self and societal narratives of a generation. In this image, we see China as a media-saturated society and as a developing information society (Giddens: 1991), but one which has still retained a personable experience of information consumption. In this pre-internet world, customers might need advice on which news or magazines to consume as they head to work. The man in this photo was that middleman, whose functions are no longer necessary with the increasing saturation of the information society we see in embryo here. At last, there is a feeling of dismay that perhaps the decline of persons like this has left the distribution and commentary of media information to invisible and powerful actors.